We have received a special delivery lately. Its one where my two youngest have been rabid for literally over the moon excited about. Funny thing is I heard of PJ masks and I kind of wondered what it was it wasnt till Son Son started naming all the characters I was like oh he actually loves PJ masks! 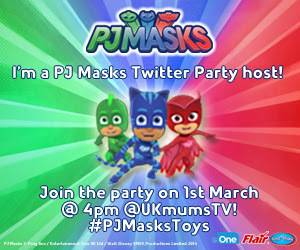 Now for us we are counting down the days till we join in the twitter party with +UKMumsTV and help host the fun twitter party this coming wednesday see hashtag #PJMAsksToys. So see all this lot we will be road testing it and having a partly please join us on Wednesday and watch this blog for more fun and too see what we thought of some of the new toys available from PJ Masks. I am not going to lie the kids are rather stoked about this one. See above all the goodies we will be trying I do love twitter parties and so do my children. Dont worry if you haven't got the same goodies there will be plenty of chances to win your own toys and see what we think of ours on Wedsnesday. Dont forget! !